The wolf spider is a strong, agile hunter that often chases their prey at high speeds. Not only are these creatures intimidating to watch, but there are several interesting facts about them you may not know. The following are 10 things you didn’t know about these incredible and sometimes frightening spiders. A wolf spider does not spin webs like normal spiders. Their primary activities include hunting and reproduction. Males often perform strange rituals before courting. This sometimes includes complex leg signals. Mating can also be dangerous as the females sometimes kill and eat the males after the process is finished. These spiders carry egg sacs during their reproduction time that can hold up to 365 eggs. Some people may believe they were named after wolves for their hairy, wolf-like appearance. The spider was named after wolves, however, because early scientists believed that they hunted in packs. Many people may know these spiders have large eyes, but may not know that they reflect light. This makes them easy to spot at night. 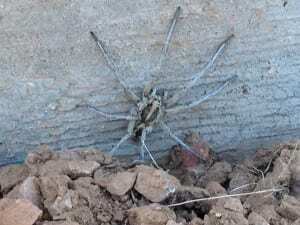 We may use the general name for all types of wolf spiders but there are different types. The South American species, for instance, has a bite that can cause serious medical problems. This species of spider actually carries their babies around on their back. After a few weeks the baby spiders are on their own. These spiders are known to be ambush hunters. They eat a wide variety of prey, depending on their habitat. This can vary extensively since they live on every continent except for Antarctica. These spiders can run very quickly. Some of them may even run fast enough to cover two feet in a second. Because of their speed, potential bite, and reproductive abilities, you’ll want to call professional pest control services to help rid your home and property of these spiders. Contact Bug Guardian Pest Prevention for help keeping your home pest free.